(East Stroudsburg, PA) – November 8, 2017 – The Monroe County Gigabit Project, its community partners and AcceleratePA are pleased to announce a community action meeting at 9:00 a.m. on Friday, November 17th to quickly update and rally residents and businesses on two outstanding broadband investments in Monroe County. With hundreds already registered, the Project needs another 200 residents, students and businesses to register their interest at the GoNetspeed.com website to support the proposed multi-million investments into Monroe County. The meeting will also provide an update on Blue Ridge Cable and PenTeleData’s significant investments into Monroe County. In a major announcement for rural broadband, Blue Ridge Cable is now offering Gigabit download speeds in multiple locations in the West End of Monroe County. 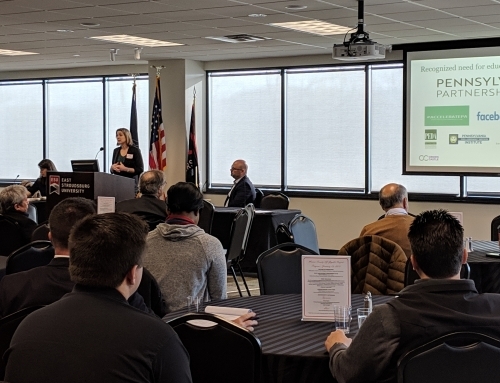 Launched in December 2016, the Monroe County Gigabit Project held community broadband meetings at East Stroudsburg University’s Innovation Center with more than 400 guests participating. The Project’s RFP results lowered business broadband rates by 50% to 88% across the County. In June 2017, the Gigabit Team extended the Project deadline through December 31, 2017 to maximize RFP results and promote the residential Gigabit offering proposed by GoNetspeed. The public is invited and encouraged to attend the meeting on Friday, November 17, 2017 at 9:00 a.m.
WHO SHOULD ATTEND: Residents, students and businesses that want faster, more affordable broadband, realtors, property owners, economic development leaders. For more information contact Rebecca Kann, Rebecca@LewisStrategic.com or 717-975-7430. To register for the November 17 meeting, RSVP on EventBrite or email Rebecca Kann. The Pennsylvania Acceleration Project (www.PAaccelerationProject.com) was established to help promote technology investment, innovation and advanced workforce trainings across Pennsylvania. 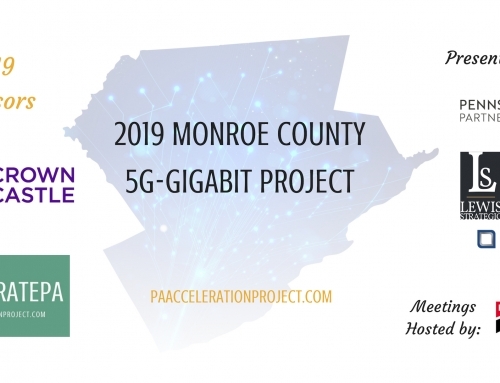 The Monroe County Gigabit Project was formed to promote broadband investments, upgrades and innovations in Monroe County.